This is one recipe that meets ALL of my top criteria for a great meal: 1) Easy – check! 2) Healthy – check! 3) Delicious – check! 4) Quick…uhhh ok so maybe not all. But hey, the actual prep time you spend on this meal is only about 5 minutes, so in that way, I guess it is quick. The crock-pot does the rest of the work for the remaining 8 hours! I was very pleased with how well this turned out. 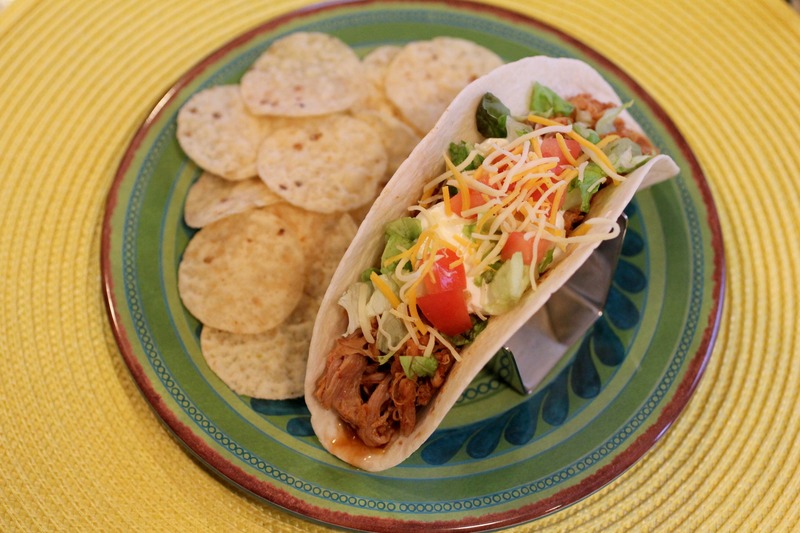 Once your meat is done in the slow cooker, all that’s left is to toss it in a tortilla and top it with whatever you like! Plus, it makes me feel good knowing that such a delicious meal is actually still pretty healthy, overall! The original blog where I found this recipe is authored by a girl who lost over 135 pounds. 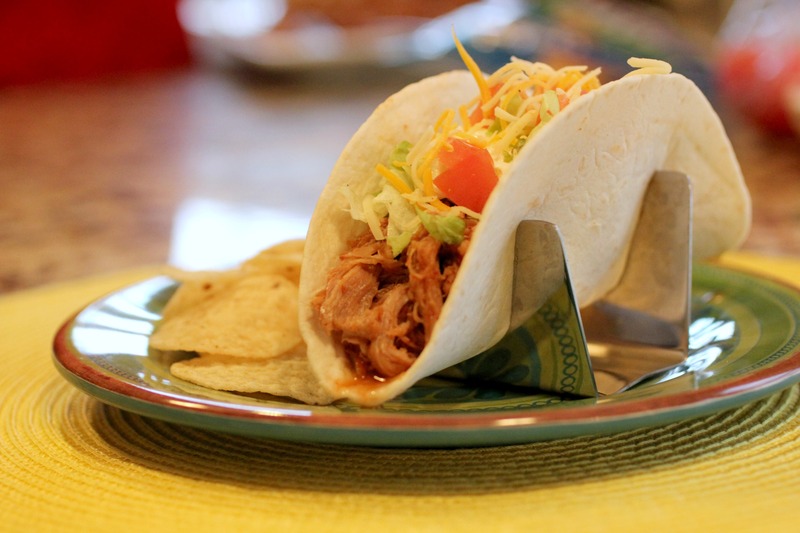 These pork tacos don’t make you feel like you’re missing out on those calories at all though, because it’s so good! Place pork in the base of your slow cooker. In a small bowl, stir together all remaining ingredients, except tortillas. Pour evenly over pork. Serve in warmed tortillas with optional toppings: shredded lettuce, sliced bell peppers, chopped tomatoes, black olives, grated cheddar cheese, and sour cream. Sounds very good! What else can I do with it after I’ve had tacos for a couple days? I live alone, so this will last about a week. Those are great ideas ksharun! Also, this pork is even good to eat by itself! You could also make wraps or sandwiches with it Maybe even make a taco pie or casserole? Hope that helps! Looks wonderful! I also like the taco holder that you have in the picture. This recipe looks beautiful! can’t wait to use my taco rack when it arrives!! thanks again Lindsay!! p.s. loving the second photo! the light is great! I completely understand what you mean! one of my personal goals this year is to improve my photography – which started with buying a more professional camera in Feb! thankfully I can now use depth of field in my photos! I’m not sure if you could freeze it before going in the crockpot because the meat is not shredded until after it is cooked. Maybe it could freeze AFTER you cook it in the crockpot? Then it would just need to be reheated before eating it. That’s my best suggestion, but I don’t do a whole lot of freezing food. Maybe another reader will know what to suggest?